The next BOM "40 Shades of Grey" arrived yesterday from Material Obsession/Auzzie. Hexagon flowers- very teeny tiny 1/2" hexis can you believe it ?!?!?!? ( gasp.....maybe- too-small methinks?) There are 7 of them to make, fussy cut, hand made using the English Paper Piecing (EPP) method, and then they are slip stiched into place, firstly onto coloured circles and then onto grey background squares. Anyway it's gotta be done, so perhaps a great project for over the Xmas hols down at the bach. I have managed a bit more progress today on my Checkerboard Squares, and I'm feeling much happier with them now. Still a few more blocks to make yet. Once again, and I do love this about patchwork, this has been "a work in progress", auditioning as I go! After re thinking, I'm going for a teal/ tangerine look, using all prints. I am adding small amounts of neutral colours like the grey/cream/yellow, which I hope will do the job of allowing everything else to shine, yes?? Talking of things teeny tiny, at the latest Auckland Festival of Quilts I found these little scissors...3 different ones for $18!!! The little gold pair are great, I have been using them for everything. There's a 3" pair that has blunt tips which you can take on an airplane so that's really handy, and the other pair are 3 1/8" embroidery scissors. I have been really keen to make a 16 Patch/ Checkerboard Squares quilt for ages now. 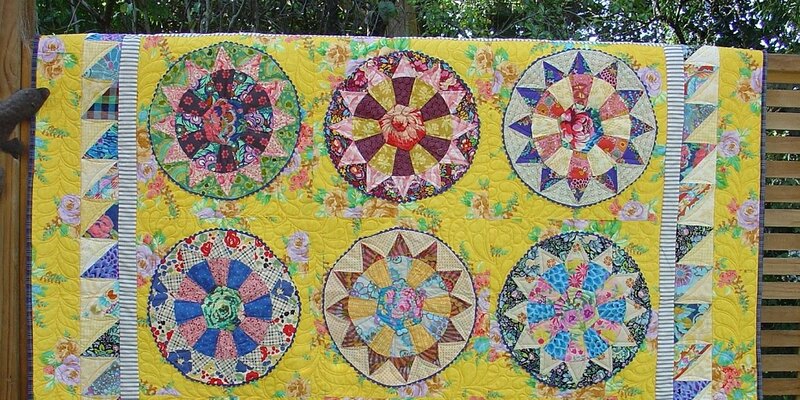 It's an old block, simple enough, and there's certainly alot of 16 patch quilts around just now. Inspiring, but sometimes I find it can be very overwhelming as well to see all these different versions of the same lovely quilt out there in blogosphere!! So, caught between "being inspired by" and "copying," I have taken some time to decide what to actually do!! I don't usually take an entire fabric collection & use only those prints in a quilt, 'cos I really prefer to mix n' match between new fabrics, my personal stash & scraps. 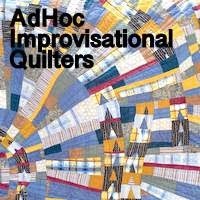 But, after making a huge Anna Maria Horner quilt top in her Garden Party range quite some time ago, I did have some fabric leftover, (of course!!!) and really wanted to use it up. I think that one of the things that makes a scrappy quilt interesting is surprises. Hey, an added bonus - these blocks are super quick to make!! Cut 4" strips of 2 co-ordinating fabrics from a fat 1/4 size of fabric, sew strips together, re-cut into 4"squares, then sew all together. Blocks will be 14" when finished. It turns out each fat 1/4 will give you 2 blocks. And, I found after making the first one, it really is quicker doing more than a couple at a time when chain piecing! A great stash buster indeed!!! Update a few days later ........ I did start out with a plan, but things changed as I made more blocks!! I have decided that I'm not including any solids after all as they seemed to really stand out. I am going for more of an overall blended kinda look now ....watch this space!!! Each Material Obsession BOM package seems to arrive really quickly. No sooner do I catch up & make the last block, the next one is here! This month is a Log Cabin & variation, Courthouse Steps, both easy enough to make. They are all certainly v. colourful. Lets just hope the (quote)"stunning clouds of grey"( unquote) soften the overall finished look just a wee bit!! with a bit of help from my friends! Thanx for all the input over my latest quandry, it's been great! First of all Glenys popped over yesterday evening, we had a wine & moved all the fabric around that I had spread out over the family room floor. Then I read the replies here & mulled over it all. Actually sometimes it's this process, all the planning/playing, etc that I love rather than doing the sewing miles!!! Then I popped out to All Things Patchwork @ Waimaukau, and Cheryl kindly did the maths for me!!! Next it was simply a matter of putting it all together! I do also plan to see Annette @Wildcotton eventually for a bit assistance too, maybe a "modern" twist on the quilting!!! And so with help from you all, I think I will have managed to find a way to bring the past just a wee bit closer into the present!!! p.s. it's back to my "granny" role for the next couple of days, playcentre, music etc - just as well I've had my sewing fix this week !!!! from stash to treasure - hopefully! Here's the thing.... I found these old blocks while I was doing the major sort out with my stash last week, and am now wondering what to do with them! I can't just throw them away!! I don't really remember the original plan for them, it was so long ago, but I only have 4 blocks like this one. option one is to simply set them with cream for lots of quilting in the -ve space to add a modern balance, maybe something like this? option two is to maybe do something sort of like the Gees Bend improvisational look? option three is to maybe do something like Material Obsession's "Stash Management" or Gwen Marston kind of thing.....go really creative & mix it all up a bit! I started but it's something that will, in all reality, actually take a bit of time & thought!!!!! one scrappy zig zag quilt top - done! What a blast from the past!! I have spent the last few days, whenever I had a spare moment, getting all my old, old fabrics sorted & bundled up nicely. And then I just wasn't too sure what to do with them all next ! We had a bit of a discussion at our last Monday Modern group about fabric & who would want/need/use my mis-mash of fabrics, you know ..."one man's trash is another man's treasure," etc. So, with that old saying in mind, I decided I would try & see if anyone did indeed want any fabric I no longer wanted !!! I signed up on Trade Me, a first for me, & away I went ........... "24 bundles of assorted fabric, approx. 20 different fabrics in each bundle, dating back as far as 1986. Selection ranging from minimum size of 1/8th to fat 1/4, some used, some untouched. Ideal instant starters stash or perfect for vintage, scrap or charity quilts. To be sold as one lot." Pop on over to Trade Me to watch the fun!! I woke & made a few subtle changes, creating five complete hexagons & two incomplete ones within the overall quilt ....can you find them?!?!?!?! I thought I would have another go at piecing triangles as my last 2 triangle quilts have now gone to good homes. They were what I would call a "one patch" quilt, using a large triangle & creating an all over pattern rather than a sampler or individual blocks, but they both were very modern in design & layout for me! And I do love them! Now that I have sorted most of my fabrics, I came across the scraps from a large Anna Maria Horner quilt I made ages ago. The finished quilt top always seemed v. heavy to me, so I guess thats why I never finished it!!!! I always felt it was something I could never sleep peacefully under!!!! This one is really gorgeous, yes? ...anyway, I thought it would simply be a case of "anything goes" .....but "anything" certainly did not !!! 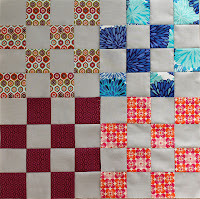 My quilt is made from the scraps but I am now, after much playing around, using selective scraps !! I have cut & planned the quilt, but it's still very subjective to re-looking /re-moving/ re-cutting! Let's just hope no one walks over it all & disturbs everything until tomorrow when I can actually get a moment to sew!!! ........... that's if I still like it in the morning !